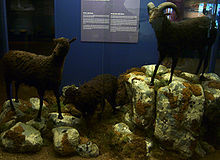 Litla Dimun sheep were a primitive, short-tailed, small, black, short-wooled breed of sheep that lived in Litla Dimun (a small island between the islands of Suouroy and Stora Dimun in the Faroe Islands of Denmark). They became extinct during the mid-19th century. They were a feral sheep, probably derived from the earliest sheep brought to Northern Europe in the Neolithic Period. The last of these sheep were shot in the 1860s. They were similar in appearance and origin to the surviving Soay sheep, from the island of Soay in the St. Kilda archipelago off the west coast of Scotland. The sheep now living on Litla Dimun are Faroes sheep, a more domesticated breed.